Established since 1992, we are an independent opththalmic opticians based in the City of London. Our vision is to offer the best products and services to all of our customers. We aim to always exceed our customer's expectations, resulting in complete customer satisfaction. We are now pleased to offer ALL our Patients with Digital Retinal Photography. 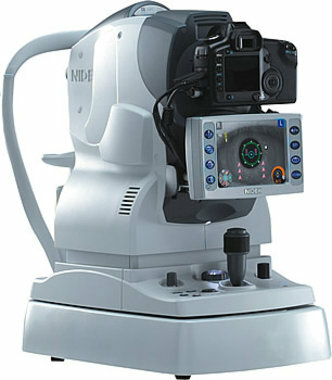 We use the latest Nidek technology to photograph the back of the eye, medically referred to as the Retina. With this photograph, we are able to show you exactly what we see in the testing room. These images are then saved on to you file to be compared with future visits. We do not charge for this service, it will be included in your eye exam. We have contact lenses available in store and can also do your contact lens check up here as well. Call us or pop in for information. If you urgently require spectacles we can sometimes make them up on the same day depending on the prescription. Call us or pop in to find out more. We can do all sorts of spectacles and sunglass repairs. Just pop in with them and we'll see what we can do!